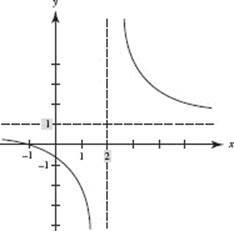 The graph of (Figure N2–4) has the x-axis (y = 0) as the horizontal asymptote. So does the graph of (Figure N2–5). The graph of has the line y = 1 as the horizontal asymptote, as shown at the right. The graph of (Figure N2–4) has x = 0 (the y-axis) as the vertical asymptote. 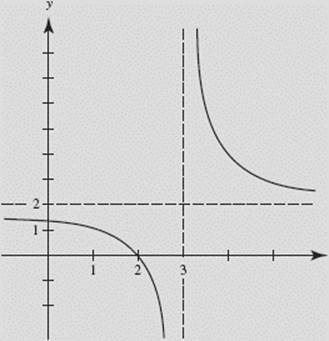 The graph of (Figure N2–5) has x = 1 as the vertical asymptote. The graph of (Figure N2–6) has the line x = 2 as the vertical asymptote. From the graph of in Figure N2–7, describe the asymptotes of k using limits.